We are delighted that you are interested in talking to us about being our aupair, and would like to talk to you more about this. We live half an hour from London by train in the town of Sevenoaks. Which is well regarded by other aupairs. I imagine that there are 100+ aupairs in this town- as there are many families with young children and it is a very popular town because it is close to London and has great amenities for aupairs. We have probably had 10 aupairs over 10 years now – and all through Almondbury and they know and trust us as a good aupair family. We are kind and honest and look after our aupairs well. Several are friends – David is coming to stay with us again from Spain and our daughter has gone to stay with Inma in Spain in Valencia. We are a caring family and help you to integrate and make friends. We are also good proactically and will help you set up a bank account, register with the doctor and dentist as well as showing you the best places to improve your English. Although we have 3 teenage sons who are living at home – there is only 1 Charlie who needs some extra help- as he has diabetes Type 1- and needs to do 3-4 injections a day. It is not necessary to have any medical training to help us – but you do need to be very patient- as he has only had this diagnosis for about 6 months. James and Robbie are 18 and 17 and are very self reliant and do most things for themselves- they like a cooked evening meal though and sometimes need collecting from school – so it is very important that you are a confident driver. We look forward to hearing more about you, and why you want to aupair with us. The family consists of Zoë (Mum), Martin (Dad) and Cara (20), James (18), Robbie (17) and Charlie (14). Cara is at Exeter University now and the boys are all in full time education. Charlie and James are at school in Tunbridge Wells and Robbie is at school in Tunbridge at Weald Grammar School. Cara’s University is about 4 hour’s drive away and she will be home for the summer or at least until early September. She is very self-sufficient and resourceful and no bother at all now she is driving. James also goes to a different school in Tunbridge Wells and he takes a train at 7.49. He has also recently learnt to drive the car- but he takes the train to school or travels with a friend in their car. Charlie takes the bus and get dropped off at ‘Londis’ in Riverhead on his return. Robbbie usually takes the train and walks to the train station. We also have 2 small dogs called Max and Fred,(who are a Cocker and Springer Spaniel). Max is nearly 10 years old and very calm and Fred is 4 and very bouncy and needs lots of exercise. We live in a lovely picture postcard, old fashioned type of Kent farm house with a large garden which we have been updating. We are 30 mins from central London on the train (10 mins walk to our station), but live in a beautiful market town of Sevenoaks, which has the cinema and theatre, a good leisure centre with pools and a gym, and all the shops you could need close by. 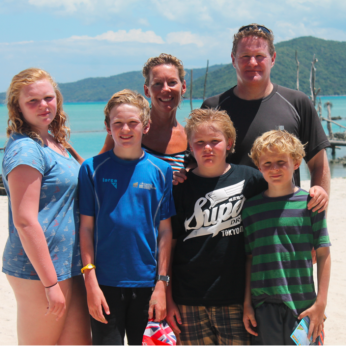 We are an active family that loves sport and the kids swim, play football, cricket, rugby. Zoë and Martin also love their sport – Zoë – Spinning, swimming and Pilates and yoga and Martin likes keeping fit in the gym, spinning and travels quite a lot with work etc. Below we would like to outline various details with regard to salary, duties and responsibilities etc. Friday : 7am to 9am and 4 to 7pm. Total Hours 25– which will now give you time to get to your English lessons. All your weekends are free. Very occasionally we might ask you if you wish to work at a weekend, as we may have to do something which does not involve the children. If this was the case it is not obligatory (i.e. you do not have to do it) and we would pay you extra which would be mutually agreed, and we would give plenty of advance notice. The children also have half term holidays for a week in October and the occasional ‘inset days ‘when we may require you to work for a full day if Zoe is working. This will only be relevant for the October holiday, when there are usually no English lessons in that week and we can arrange to pay you an additional amount for the hours worked. You will be entitled to 4 weeks (20 days) holiday on an annualised basis (i.e. for 12 months of working) plus any UK bank holidays. The Children have 1 week holiday in October, 2 weeks at Easter and one week in February- and we would not recommend that you take any holiday then please.. But we are flexible and can usually fit around what you want to do. We now have an aupair from Almondbury and would like a someone to replace him in June 2019. Please get in touch with: admin@aupair-agency.com if you are interested.